We look back on all the highlights from D23 Expo 2015! D23 Expo 2015 took place this past weekend in Anaheim, California and hopefully you’ve been enjoying our on the scene coverage straight from the Anaheim Convention Center. This year’s expo, which launched with a special media preview last Thursday night, featured a lot of neat surprises out of Lucasfilm, Marvel, Pixar and both Walt Disney Animation and the live-action studio, Walt Disney Pictures. On the latest episode of Most Craved, we’re looking back at D23 Expo 2015 and recalling the biggest reveals and the best surprises. Check it out in the player above! D23 Expo 2015 began in full on Friday with a Disney Legends induction ceremony. Among those joining the honored ranks this year were George Lucas, Johnny Depp and Danny Elfman. After that, a Disney Animation panel took a look at Pixar’s upcoming The Good Dinosaur, Finding Dory, Toy Story 4 and the just-titled Coco, as well as Disney Animation’s Zootopia, Moana and the newly-announced Gigantic. On Saturday, the live-action panel showed off footage from Marvel’s Captain America: Civil War, animated concept art from Doctor Strange and first looks at films like Alice Through the Looking Glass and The Jungle Book. There, it was also revealed that Disney is planning massive Star Wars additions to its theme parks on both coasts. This week’s hosts include Jenna Busch of Legion of Leia, William Bibbiani of CraveOnline and our own Silas Lesnick. Don’t let the conversation stop with us, though! 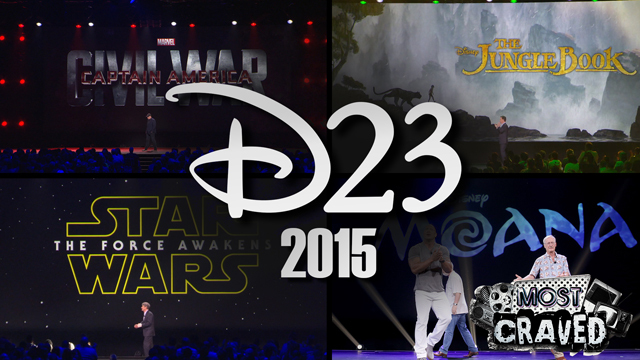 Let us know what you liked best from D23 Expo 2015 in the comments below! We’ve also launched the official Most Craved Twitter feed and we’d love it if you’d give us a follow! You can watch previous Most Craved episodes by clicking here.